The ocean and beach are beautiful, but they can also be deadly. Here are a few tips that will help ensure that you have a safe and pleasant vacation. Resting and playing on Hampton Beach is extremely rewarding. Consider these points when going to the beach. Protect yourself and family from overexposure to the sun by using a high-number sunscreen. Hydrate yourself and your family. On a hot summer day, it’s easy to suffer from heat stroke. Use proper tools and protection when doing anything outside. Hats, sunscreen and proper sports gear, such as a bike or skateboard helmet, are all important. Be knowledgeable about tides and phenomenon such as undertow that can quickly pull you under or out into the ocean. Rip tide can also be dangerous. Be aware of ocean temperature. The Atlantic in New Hampshire can be extremely cold, causing hypothermia. Make sure there’s a lifeguard. Make sure companions know where you will be. Losing track of a loved one while along the beach can be nerve wracking and dangerous. Kids love to dig in the sand. But the truth is that every year some kid digging in the sand creates a hole much taller than he/she is with the sand caving in and burying him/her. Never dig a hole in the sand that is taller than you are. Be aware of foreign objects in the sand that can harm you. Violent thunderstorms can pop up anytime. When you hear thunder vacate the beach immediately. Be aware of the temperature. Hi temps in high humidity can dehydrate you. 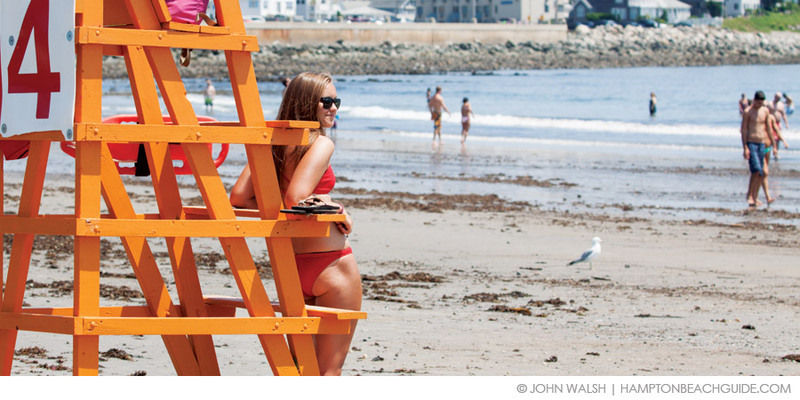 Hampton Beach has one of the best beaches in New England. Enjoy it by using common sense and care. Enjoy your visit to Hampton Beach, NH.